Aitrayee Sarkar shares her take on writer and poet Nabarun Bhattacharya, on the occasion of his first death anniversary. 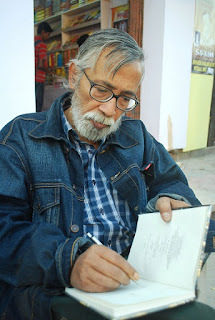 My first meeting with Nabarun Bhattacharya was in the Kolkata Book Fair. Film critic Sanjoy Mukhopadhyay introduced us right in front of the Bhasabandhan stall. Seeing him sitting on a chair or chatting with someone standing near the stall was quite a familiar sight to all of us. Fans often thronged around him for having an autograph (However, I am not quite sure whether they had the courage to approach Nabarun for a selfie). I still remember after our initial introduction he told me—“why don’t you sent some poems for Bhasabandhan?” I wasn’t ready for that. Here in Bengal famous intellectuals like Nabarun do not approach a new comer with that ease. Trust me, it’s very very unusual. Anybody would have grabbed the opportunity with both hands and perhaps send him a series of poems for Bhasabandhan within days. But out of my famous laziness I didn’t do that. Today I often curse myself for doing so. Finally, I wrote in Bhasabandhan, but Nabarun Da was not there to see that. Nabarun Bhattacharya is my favourite writer and poet. I adore his style of writing which rejects all kinds of pretension. I know that his ‘Fyataru’ series is perhaps extremely popular but I would always go with the novel ‘Lubdhak’. It has always fascinated me. Later, something really unexpected happened. Out of the bloom I got a chance to act in director Q’s much talked about documentary on Nabarun Bhattacharya. I still remember reading a series of poems of Nabarun in front of the camera. I also read excerpts from ‘Lubdhak’. And when asked about Nabarun’s relevance in modern Bengali literature, I could only manage to say that “we all are Nabaruns, either through actions or inactions”. Nabarun’s art of anarchy is a gift to the modern society, a place where we only survive, don’t live. He questioned the rules and was always ready to break them at will. The legacy of Nabarun is still alive through his remarkable creations and of course with the ‘Bhasabandhan’ magazine. His family members and friends have been working very hard to publish the magazine on a regular basis, maintaining the high standard that had been set by the writer himself. It seems that Nabarun Bhattacharya’s struggle has not ended with his demise. In fact, the real challenge has only begun. Nabarun, in his last editorial note in Bhasabandhan, wrote about the challenges before a writer. I don’t know whether he had a hint of death. I feel assured to see that new readers are still exploring Nabarun Bhattacharya in a new way. Perhaps death is just a formality, it has never been the end of the road for masters like Nabrun.